At Wilkinson Environmental we have over 28 years’ experience within the drainage services industry. We work throughout Warwickshire and the Midlands and had the pleasure of completing a sewer cleansing job and CCTV drain survey next door to historic Warwick Castle. Not all drainage surveys are as picturesque as this one and as we are based in Atherstone, it was right on our doorstep! Our crew had to clear a 900mm diameter heavily silted and blocked private sewer. The site, which is under development, had to be tracked and marked but due to the cast iron pipework present it was difficult to trace with a standard sonde tracker so we resorted to using a CAT and Genny signal generator. 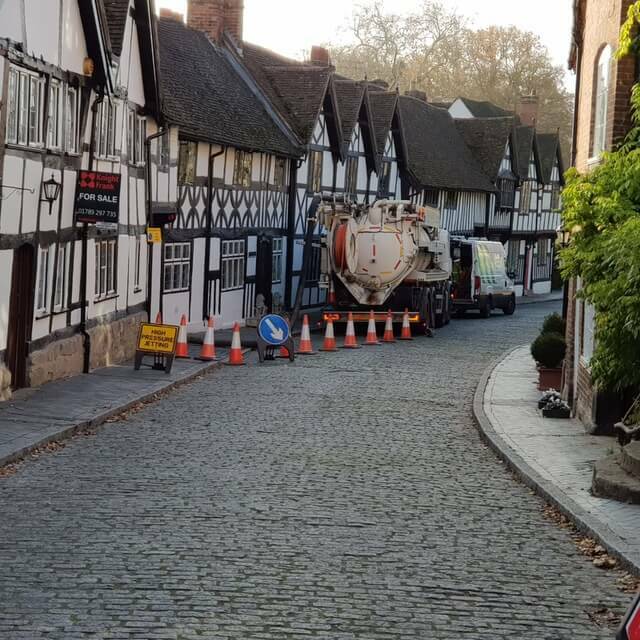 Access to the site was also a little tricky for our recycling jet vac unit due to the narrow cobbled streets and historic buildings. There was limited vehicle access to the manhole also, but we prevailed and successfully surveyed, jetted and cleaned the sewer. Wilkinson Environmental specialist in emergency drain blockages, drain cleansing and CCTV drain surveys throughout Warwick, Coventry, Royal Leamington Spa, Sutton Coldfield, Tamworth, Nuneaton, Rugby, Leicester, Wolverhampton and Worcester.